Lemon and and rose petals give this deliciously light cake an exotic note. 1. To make the white chocolate cream, place the chocolate in a medium bowl and set aside. Put 140ml double cream in a small saucepan and place over medium-low heat until it just starts to simmer, then pour over the chocolate. Allow to sit for three minutes, then add the rosewater and stir gently until the chocolate is fully combined. Cover with cling wrap and refrigerate until completely cold – about one hour. 3. To make the cake, blitz rose petals, 100g sugar, lemon zest and juice and vanilla seeds in a food processor for about a minute, until the rose petals are finely crushed. Tip into a large mixing bowl, add 140g sugar, flour and salt, and whisk to combine. 4. In a separate bowl, whisk together egg yolks, oil, water and rosewater. Make a well in the dry rose-petal mixture and pour the yolk mixture in, then gently mix to form a smooth batter. 5. Using an electric mixer, whisk the egg whites on medium-high speed for about a minute, until frothy. Add the cream of tartar and beat until soft peaks form. Gradually add the remaining 60g sugar and beat until stiff peaks form. Gently fold this mixture into the rose-petal batter until well combined. 6. Pour the batter into an ungreased, unlined 23cm chiffon cake tin (a round tin with a central pipe – this shape helps the batter rise evenly and majestically). Bake for 50 minutes, or until a skewer inserted into the centre of the cake comes out clean. 7. Remove from oven, turn the cake (still in the ungreased tin) upside-down on a rack and set aside for at least one hour. When cake is cooled, carefully remove it from the tin using a metal spatula and place on a serving plate. 8. For the icing, use an electric mixer to whip the white chocolate ganache with the extra 240ml double cream on a medium-high speed until thick (about 30 seconds). 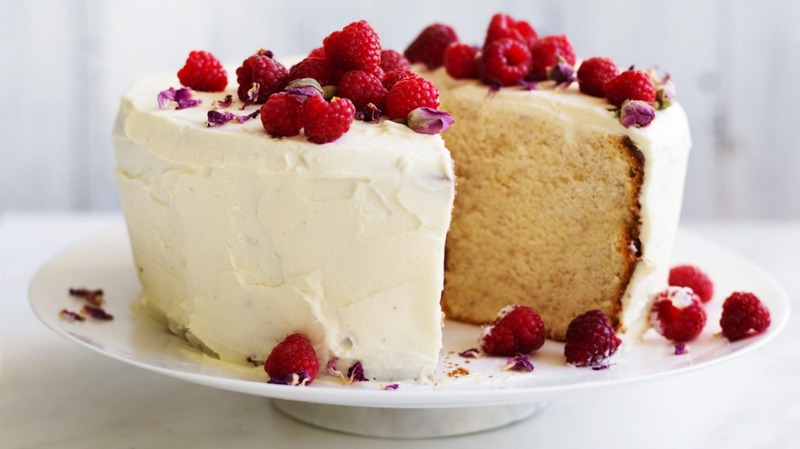 Spread over the top and sides of the cake, and scatter over raspberries and extra rose petals.